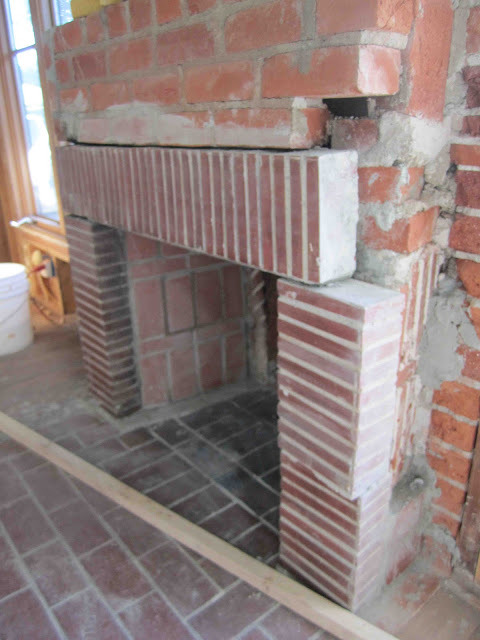 From Purdue to Provence: Getting Fired Up About Our New Fireplace! 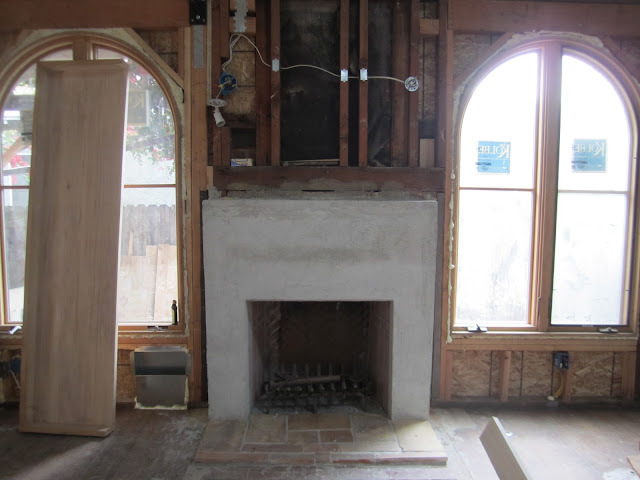 Here's what happened: We added these giant five foot arched wood casement windows on each side of the fireplace. 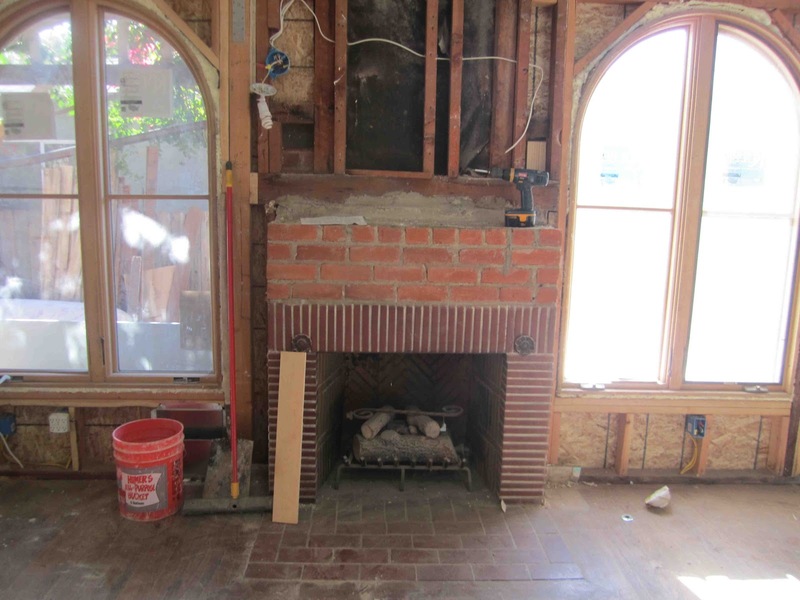 The window on the right had to be moved over to accommodate a structural beam, which meant the fireplace box was no longer symmetrically positioned between the windows. Ah, one of the many retrofitting challenges of renovating a house rather than building one from scratch. Here's another view of those arched windows. Messy yes. But this shot reveals how different a room looks and feels when you take out the ceiling and three walls. It opens it all up. 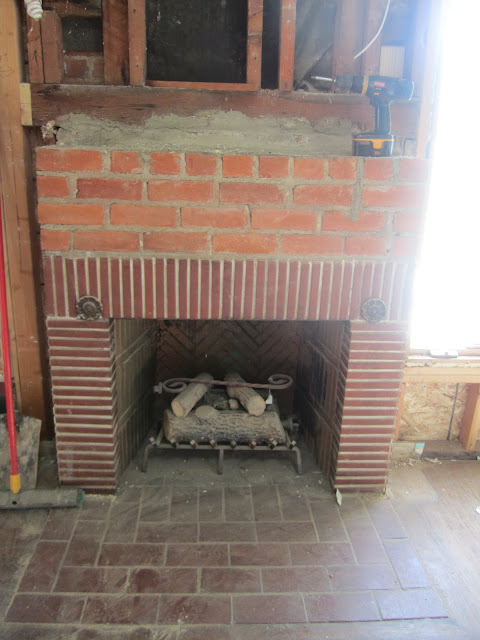 Here's a shot of the fireplace with the traditional wooden box removed. Somehow we knew we'd have to even this all out to make the fireplace symmetrical to the new windows. So, we reshaped the new fire box by moving the entire thing over and adding new brick inside. It's not final yet, but you can see the new fireplace taking shape. We had just a tiny bit of the reclaimed french pavers left, so we covered up the old brick with the last few pieces so that this hearth will tie into our kitchen floor, making the two spaces more cohesive. When we finish this great room floor with polished concrete, it will be flush with the hearth. We contemplated putting a nice chunky piece of wood on top of this fireplace for the mantle, but I think we like the clean, modern lines of this one. It will be one of those features that give this house a modern "twist." We'll add smooth white plaster over this and lime wash on the inside so you won't notice the disparate sizes of brick. I imagine an eight foot organic driftwood piece of art above this mantle and already have my eye on one. I'm thinking it will help to keep this fireplace as the focal point of the new giant room, yet also draw your eye up toward the ceiling. There are track lights installed on the ceiling, so I imagine it would create a nice play of light on all of those interesting wood crags and grains, especially at night. We'll see. Mirrors are also nice! 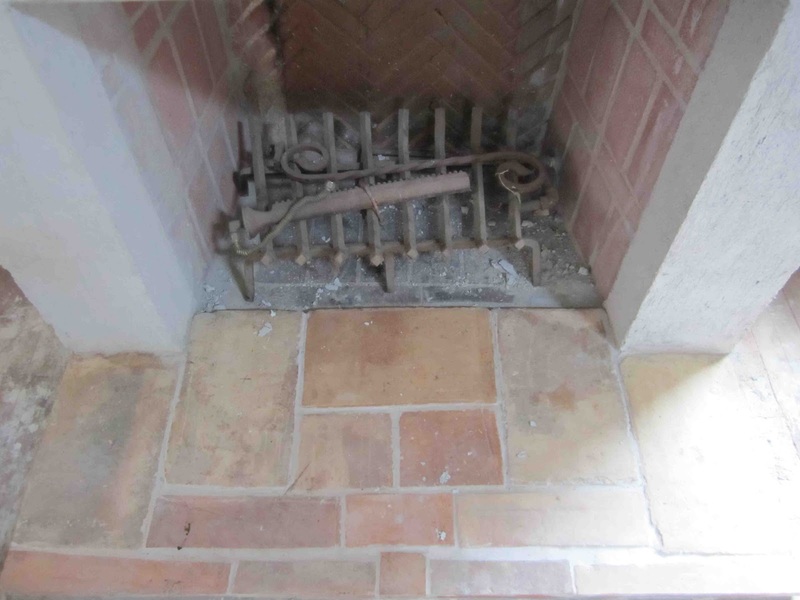 A close up of the french paver hearth. This will clearly establish the color palette for this room. Just another view that mirrors the first photo in this post. Wow. It's a little scary at this point. Hope we did the right thing! Here's a nice inspiration photo, which I found on one of my favorite blogs: Velvet & Linen by Brooke Giannetti. 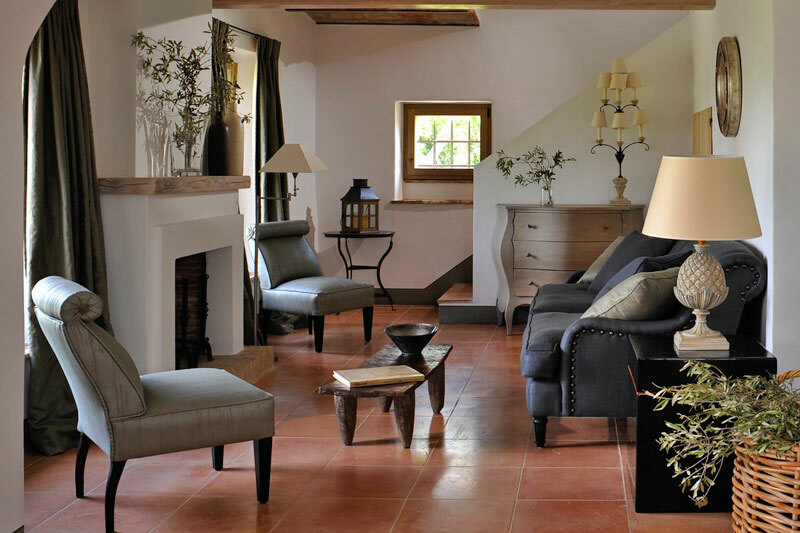 This modern plastered fireplace is from a a home called "Arrighi" as seen at Italianvillas.com. I do love the feeling of this clean, modern space juxtaposed with the rustic wood beams. Here's another room from the same villa. 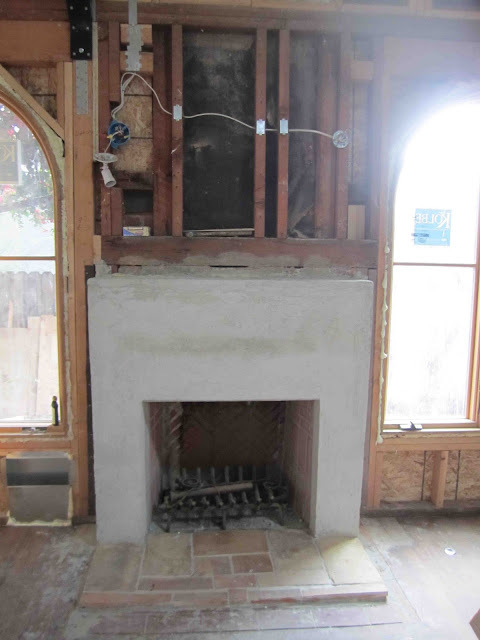 Another clean plastered fireplace. The combo of the clean plaster and the warm wood tones is so soothing. It's a look that just doesn't feel like it would ever go out of style. 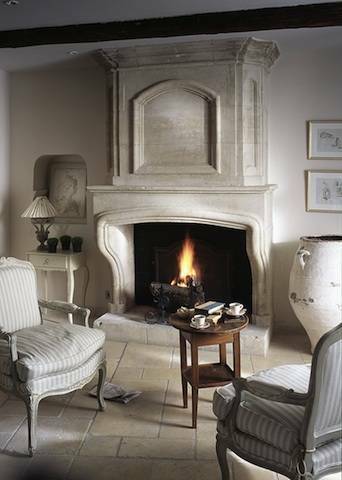 This post wouldn't be complete without a nod to the traditional French limestone fireplace with its lovely curvy lines and substantial vertical size. Now, this is a focal point in a room. No doubt about that. What do you think? When it comes to fireplaces, are you more modern or traditional? And why?